Mac, Windows 10 and other versions, Android apk, iOS like iPhone etc Now, the good news is that iPad devices can now download the app from Apple Store without issues. This calendar app developed by Google for iPad users, has everything Android Google Calendar App has in it. The ipad app is very much similar in feature and design to that of Android platform app. But as you may know, the only difference it got is that, the calendar app was optimized just for the use on iPad devices manufactured by Apple company. 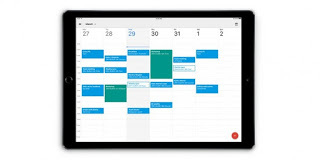 In other words, each platform of mobile and PC has its own calendar app from Google. The features of this calendar app for iPad is quiet cool and nice. You can easily make your search on the calendar from your iPad home screen without stress. Very simple and fast to operate on. With the new app, you’ll get all the Calendar features you know and love," Plus, you can search your Calendar easily from the iPad home screen with Spotlight Search. The Google Calendar v2.0.0 app can be downloaded to your smart device right from Apple App Store for iOS. Click here to get it installed on your ipad phones. Read Also: Tips On How To Get Your iPhone/iPad Charge faster when plugged on light.